TriMet’s solar project at the South Terminus of the MAX Green and Yellow lines at SW Jackson Street is now operational. Located near Portland State University, it’s the largest solar project in downtown Portland and a first for the MAX light rail system. 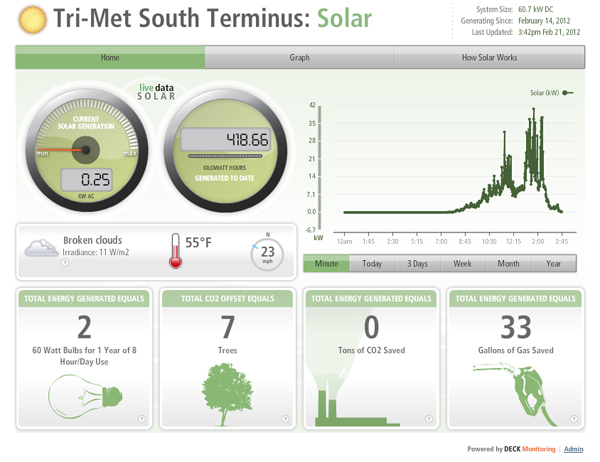 Performance of the system can be monitored live online at http://live.deckmonitoring.com/?id=tri_met_south_terminus. It will produce approximately 65,000 kilowatt hours (kWh) of energy annually, offsetting energy used by site lighting and two light rail electrical system buildings. The excess energy produced will add clean energy to the Portland General Electric grid. The total energy produced is equivalent to reducing 29 tons of carbon dioxide per year. Estimated first year energy savings for TriMet is $4,880, based on 2011 rates. Over the 25-plus-year life of the solar system, TriMet will earn more than 25 times its initial investment as the value of electricity generated continues to be credited against its power bill. This credit will increase as electricity rates rise over time. Solar panels enclose the pre-fabricated rectifier and signals buildings and screen views from surrounding buildings. The City of Portland permit specifies the buildings have this enclosure. The project is in the City of Portland’s design overlay zone and had to meet Central City Design Guidelines. These guidelines call for emphasizing Portland themes, including sustainability, and for enhancing views of and from the Central City. Approval was granted (March 2008) for “two pre-fabricated buildings to be enclosed beneath a steel-frame structure of photovoltaic panels and metal-mesh screen”. The solar panels and other sustainable features in the project helped secure approval of the project application. TriMet used $1.2 million of federal stimulus funds to pay for the supporting structure. Using wire mesh instead of solar panels was estimated to have cost about $75,000 less than using solar panels. The solar system qualified for grants, tax credits and incentives that would lower installation costs by more than two-thirds. The solar system allows TriMet to reduce the amount of electricity it needs to purchase for operations. West of the Cascade mountain range, our sunny summers offset our cloudy winters, giving Portland and Eugene as much annual solar energy as the national average. This 61 kW system is the largest PV system in downtown Portland. The next largest system is on Lincoln Hall at PSU (53 kW). There are larger installations outside the central business district—the 100 kW system on Powell’s Books Warehouse in the Northwest industrial area, for example. Portland Public Schools has several 100+ kW systems located on schools throughout eastside and Northeast Portland. The Northeast area along Airport Way has a number of 100+ kW systems on industrial buildings. A “DECK” energy monitoring system will allow on-line access to live data from the installation. PSU students, researchers and others are expected to harvest the data for educational and analytical purposes. Installation cost totaled $366,000, with $263,151 in grants and credit offset, making the net installation cost is about $102,849. TriMet’s share is $4,936 and recouped in a little more than a year. *Project pre-certified under the “old” Oregon Business Energy Tax Credit program for a passthrough payment at the rate of 36.821%. Over the next several months TriMet will identify a business “passthrough partner” willing to take the tax credit, spread over five years, in exchange of a $134,765 payment to the agency. Through “net metering,” PGE will reduce TriMet’s monthly bill for electricity used at the South Terminal in proportion to the amount of power the solar system generates. Two TriMet facilities on site are included in the net metering agreement, each with its own meter billed at different rates. For the 12 months ending 12.01.11, the signal/communications building consumed 27,520 kWh; while the substation building (which feeds power to run trains) consumed 952,000 kWh. The maximum annual net meter credit, $4,880, is the value of the system’s estimated annual generation of 64,360 kWh, shown below. TriMet’s estimated first year savings is $4,880, based on 2011 rates. Over the 25+ year life of the solar system, TriMet will earn more than 25 times its initial investment in savings on its electricity bill. This savings will increase as electricity rates rise over time.